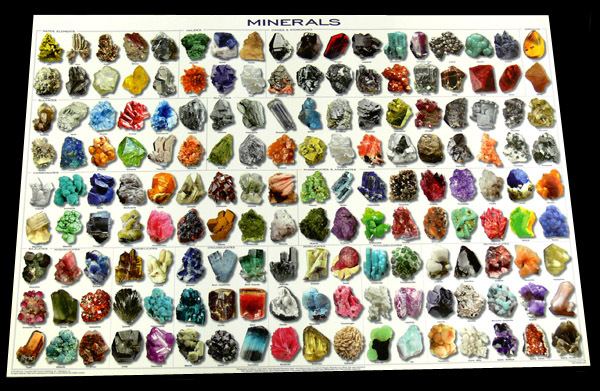 Our stunning Mineral Poster is a must-have for anyone interested in rock collecting, minerals, gems, etc. The poster shows a whopping 162 specimens, carefully selected to include those most likely to be encountered by the student or collector. Over 20,000 photographs were reviewed to select specimens that would best show a diversity of color, habit, luster and crystals. 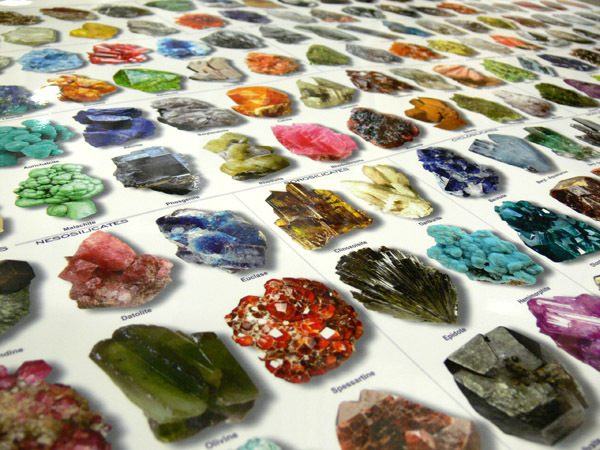 These magnificent minerals are presented by class: native elements, carbonates, sulfates, sulfides, halides, oxides, phosphates, organics and silicates. The silicates are such a large group that the bottom three rows are devoted to them. They are grouped by sub-class, such as neosilicates, sorosilicates, and cyclosilicates. All popular gemstones are also shown. The 24" x 36" poster is sealed in a heavy crystal clear plastic laminate making it waterproof and very resistant to damage.